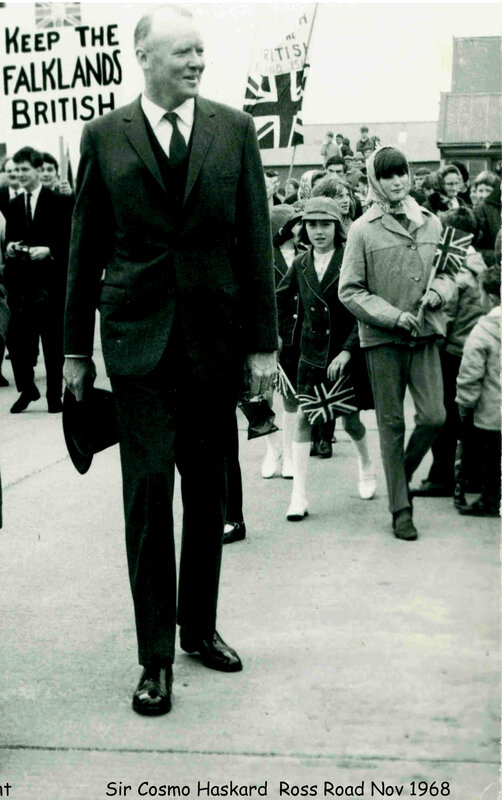 Governor of the Falkland Islands from 1964 - 1970, Sir Cosmo Dugal Patrick Thomas Haskard, KCMG, MBE, passed away peacefully at his home in Tregariff, County Cork, Ireland, on February 21, aged 100. Sir Cosmo was born in Dublin in November 1916 - only a few months after the Easter Rising. His father, John McDougal Haskard, was an officer in the British Army, and a landowner in County Cork. The young Cosmo was educated at Cheltenham, and then went on to Sandhurst, where he passed out second. But ill health prevented an immediate military career, and so he went up to Cambridge in 1937. There he read modern languages, joined the University Officer Training Corps and, as war with Germany approached, was commissioned into the Territorial Army. Following the outbreak of war he joined the Royal Irish Fusiliers, but in 1940 he transferred to the Colonial Service and was posted to the King's African Rifles in Tanganyika. He served in Ceylon and Burma and earned an MBE (Military). He was demobilised in 1946. Cosmo then spent the rest of his working life in the Colonial Service. He began in Nyasaland (Malawi) and met his future wife Phillada Stanley there. They married in 1957. He was appointed CMG in 1960. Cosmo continued on in Malawi after independence in 1961, serving in the administration of Dr. Hasting Banda. In 1962 his son Julian was born. In 1964, Cosmo was appointed Governor of the Falkland Islands and Commissioner for Britain's Antarctic Territory. He was knighted in 1965, as a KCMG. Sir Cosmo and his wife found the Falklands to their liking. They were used to life in isolated places, and their young son attended the Junior School in Stanley. They got on well with the Islanders. The Argentine threat to the Falklands had been emphasised by the landing of Argentine fanatic Miguel Fitzgerald in a light plane on Stanley racecourse shortly before Sir Cosmo arrived. As a result, Sir Cosmo recommended that the platoon of 30 Royal Marines then on board the local guard ship HMS Protector be retained in the Islands. These were the first of the tiny garrison/training detachment that was stationed in the Falklands right up until the 1982 invasion. During his time as Governor, Sir Cosmo played a critical role in opposing the Memorandum of Understanding (MoU) between Britain and Argentina which came so close to being signed in November/December 1968. This was the agreement that was intended then as the first step towards ending the sovereignty dispute with Argentina - in effect by paving the way for a handover of sovereignty to that country. Negotiations over this had begun after UN Resolution 2065 in December 1965. Aggressive Argentine negotiating had forced the principle of Islander consent out of the text of this document. Instead, Britain clung to this principle by the precarious device of saying that a Unilateral Statement would be made in Parliament at the time of signature and publication of the MoU saying in effect that it could not be implemented without Islander consent. This was done by saying that Britain would never be satisfied with any subsequent guarantees made by Argentina to the Islanders - unless the Islanders were too. This technically gave the Islanders the option to resist any handover. Islanders, however, were still kept in the dark about the whole plan. But long before this, Sir Cosmo had become so concerned about the way negotiations were going that he went to London in 1967 to report Islander opinion to the Foreign Office and Foreign Secretary George Brown. He said that Islanders were completely unprepared for the MoU, were bitterly opposed to any handover of sovereignty, and would fiercely resist this. His words fell on deaf ears. Britain had other considerations: trade with Argentina, support at the UN over Rhodesia, etc., and Britain was also in the process of actually removing the Chagos Archipelago Islanders from their homes then. On his return to the Falklands, Sir Cosmo encouraged the handful of Islander Councillors, who knew about much of the plan but were bound by oaths of secrecy, to go out and defend themselves. They did so by writing to every MP in Parliament. Around that time the Falkland Islands Emergency Committee was formed by allies in Britain. It organised support for the Islanders in their struggle for survival. That committee evolved into the Falkland Islands Association of today. The situation came to a head in November and December 1968. The final wording of the MoU had been agreed with the Argentines that August, and the Argentines also knew what Britain's Unilateral Statement would say. The plan was for Junior Foreign Office Minister Lord Chalfont to visit the Falklands that November to coincide with the signing and explain it all to the Islanders. It was to be a fait accompli. But the signing had to be delayed because Foreign Secretary Michael Stewart was away in India. And Lord Chalfont's visit could not be postponed as it depended on the sailing times of British ships in the South Atlantic. So Lord Chalfont's visit took place before the MoU was signed, which meant he had the task of explaining the details of its final provisions to a horrified Council - while there was still a chance of stopping it. He was accompanied by journalists, and this got publicity in the British press, particularly the Daily Express. Its famous photo of Islanders demonstrating by the Whalebone Arch in favour of continuing British sovereignty was most effective. Then the Argentines shot themselves in the foot. On the way back to Britain, Lord Chalfont passed through Buenos Aires, and made a courtesy call on Nicanor Costa Méndez, who was the foreign minister for the military dictatorship of General Ongania (Costa Méndez was later to be foreign minister again in 1982). Costa Méndez told Lord Chalfont that Argentina would not sign the MoU unless Britain dropped the guarantee of Islander consent from its Unilateral Statement. This was a bombshell. Lord Chalfont replied that this would put an end to the agreement. The British Government had defended itself against criticism by saying that nothing would be done without Islander consent. So the contents of Britain's Unilateral Statement were vital. Argentine threats not to sign the MoU unless the British dropped this guarantee followed as Lord Chalfont proceeded on to London. They poisoned the atmosphere completely. This threat was only dropped two days before the Cabinet met to finally decide on the MoU - by when unfavourable British press coverage and Parliamentary opposition had made the Argentines realise their mistake. It was too late. An angry Cabinet rejected the MoU and said that any future agreement must include Islander consent or have such consent specifically linked to it in some other way. It had been a close run thing. There can be little doubt that without Sir Cosmo the MoU, or some similar agreement, would have led to the handover of the Falklands to Argentina. His action in informing the councillors as much as he could, and supporting them, allowed the Islanders to defend themselves successfully. He is honoured in the Islands for this. Sir Cosmo retired after serving as governor in the Falklands. He returned to his native Ireland, where he remained active for many years. He maintained a keen interest in the Falklands, and served the FIA well as a distinguished Vice-President. The Falkland Islands Government honoured him on his 100th birthday, in November 2016, with the gift of a painting of Government House in Stanley. It was hanging over his bed when he died three months later. Sir Cosmo is survived by his widow Lady Phillada, his son Julian, his daughter-in-law Michelle and three grandsons, Cosmo, Piers and Hugo.